Beach & Golf. 3 Bed/3 Bth. Kiva Dunes. Corner wrap 420 sf Balcony. @18th green. Welcome to Sweet Tee at Kiva Dunes Beach and Golf Resort. We invite you to stay at this little corner of paradise. If the hustle and bustle of the beaches at Gulf Shore are not for you, then Kiva Dunes is what you are looking for. 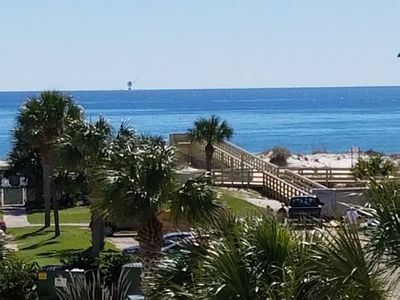 Located on the beautiful and quaint peninsula of Fort Morgan, Kiva Dunes resort offers the largest, white sand private beaches in Alabama as well as the highest ranked public golf course in the state. The views are simply breathtaking. The balcony views from Sweet Tee over the 18th green and down the fairways in the evenings are amazing. 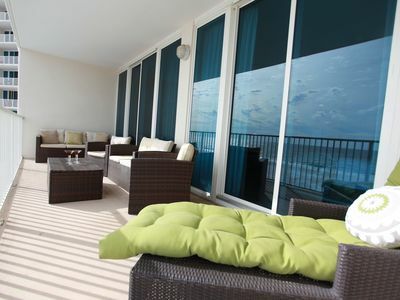 You will really enjoy hanging out on the balcony and eating breakfast or having a cocktail. And you won’t find huge crowds here. Your slice of paradise will give you all the peace and serenity and fun that you need. 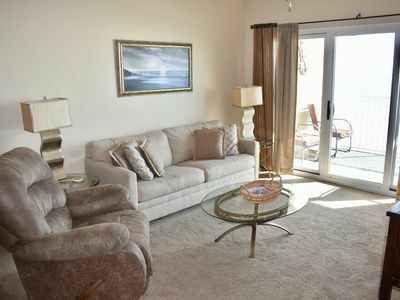 Sweet Tee condo (unit 401 Kiva Lodge) has been completely remodeled and is located on the 4th floor of Kiva Lodge. Kiva Lodge exterior has also been renovated in 2019. It overlooks with 18th green and fairway of the award winning Kiva Golf Course. 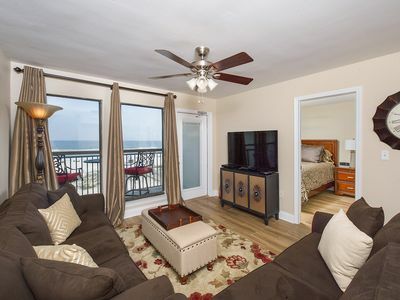 The wrap around balcony offers you great views of the course, as well as glimpses the bay off the right and the Gulf of Mexico off to the left. The balcony alone is 420 square feet! 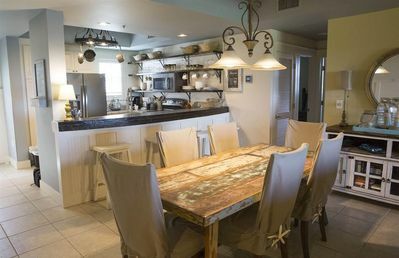 The balcony has tons of room for everyone: Full table and chairs to enjoy a meal, 4 comfy cushion chairs to sit and watch the golfers coming in, and 2 reclining chairs to read in. Kiva Dunes offers many great amenities for its guests...4 pools, one of which is a salt water pool right at the beaches edge, a hot tub, golf, driving range, a pro shop, work out room, tennis courts, dining at the golf course or outdoor dining at the Beach Blub and food service even out at the beach. And with only 23 units in Kiva Lodge you will have the peaceful getaway that you were hoping for. 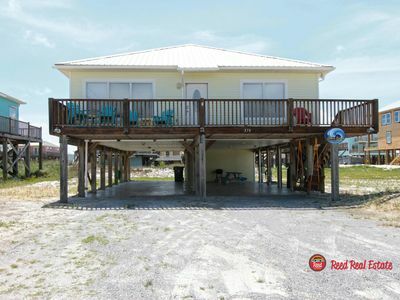 This unit has everything you need for your getaway...3 bedrooms and 3 baths which sleep 6. The master bedroom has a king bed, golf course and gulf views, private bath with double sinks and a deep soaking tub with separate shower. 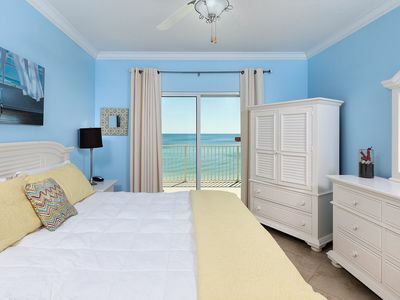 Twin bedroom has two twin sized beds, gulf view and its own full bath. The third room also had a king sized bed and the room offers privacy with en suite full bath. All bedrooms have new mattresses and smart TVs. Need to sleep a few more people? No problem. 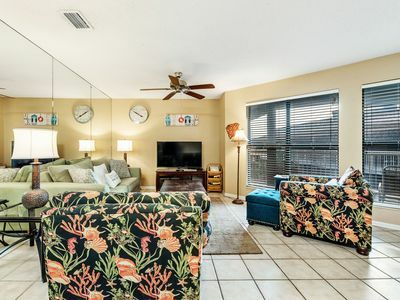 There are two large couches in the den, plus two full sized fold-out cushions perfect for little kiddos that can be found under one of the beds The kitchen has a modern design with floating shelves, new stainless steel appliances, new cookware and dishes and a Keurig coffee maker. The living room at Sweet Tee has a wonderful view down the 18th fairway and the waterway that runs the length of the course. Sit on the balcony and watch the sunset while golfers try to sink their putts on Alabama's largest green. The den has a large flat screen tv with sound bar which you can connect to so you can play music, double sofas with 2 recliners in each (that's 4 recliners!) . The cabinet is full of movies, books and board games for you to enjoy, plus a WiiU & games for the kiddos. 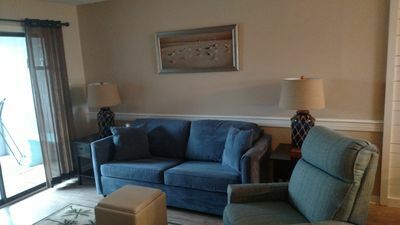 Snuggle up on the comfy loveseat and enjoy a relaxing evening at Kiva Dunes. 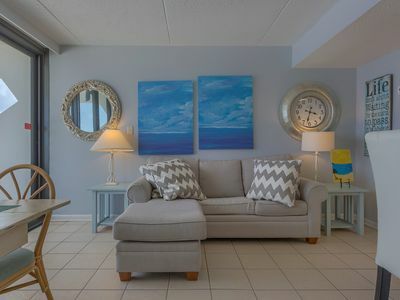 Each bathroom has been fully remodeled with updated tile showers, multiple shower heads including a rainshower head and personal hand held shower head as well. The master bath has a lovely new rustic wood sink vanity with two raised vessel sinks and a deep soaking tub to enjoy after a day at the beach or an afternoon on the links. 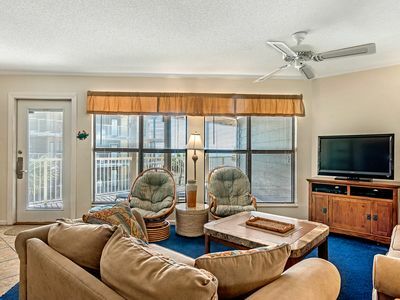 The condo also has tennis racquets so you can head down to the courts. How does a bike ride around the property sound? In one of the closets you will find two citizen bikes for your use while on vacation so bring a helmet if you plan to ride. 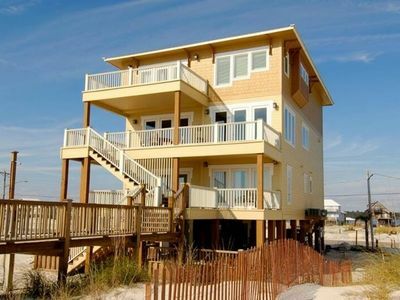 Take a ride and see all the great sites and the beautiful beach houses in the Kiva community. 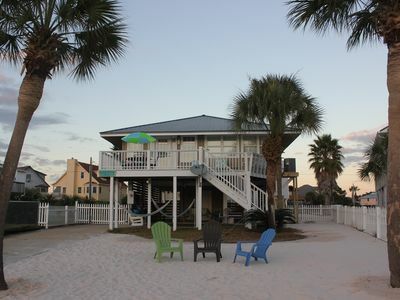 Or ride down to the Kiva Beach Club and sit by the pool or grab a cocktail at the bar and watch the sunset over the Gulf of Mexico. Or ride outside the front gate and take a seat on a park bench and watch for dolpins playing in the Bay. Ready for the beach? Take the quick ¼ mile walk down the road, bike or you may prefer the free Kiva shuttle which runs seasonally and can take you anywhere on property you like. 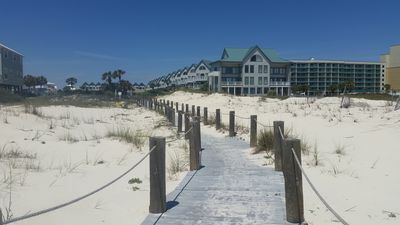 At the Beach Club will find a beautiful beach front zero entry pool with a splash pad for the kids and a huge hot tube, open air restaurant, changing rooms with a shower, towel service, spa services and bathrooms. Don’t forget your wrist bands and download the Kiva app to have drinks or meals delivered directly to you at the pool or even AT THE BEACH! 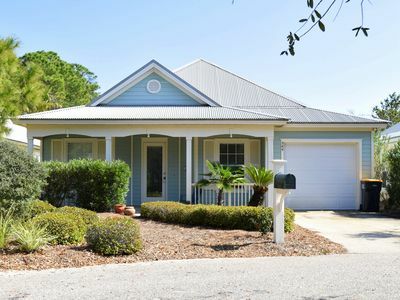 Reserve your stay in paradise today and make Sweet Tee at Kiva Dunes your new home away from home. Learn more about Kiva Dunes by visiting the Kiva Dunes resort website directly. You will find Sweet Tee there in Kiva Lodge Unit 401 available for rental. You can even book your stay there! 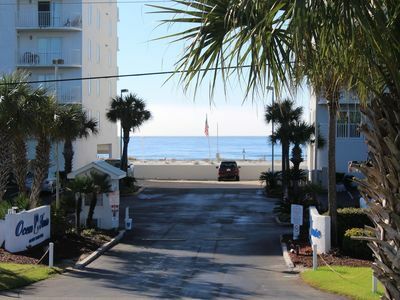 -Still want to enjoy the Gulf Shore area, no problem, you are just 15 minutes away. And the drive up and down the peninsula is lovely. We purchased the Unit in November 2018. The previous owners had beautifully remodeled the unit and we fell in love with it. We came in and made a few additional upgrades. We hope that you will find that Sweet Tee has everything that you would hope for in a vacation. 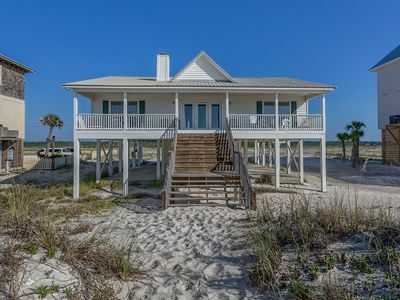 When we decided to purchase a vacation property, we did not look any further than Kiva Dunes. It is truly a unique property. 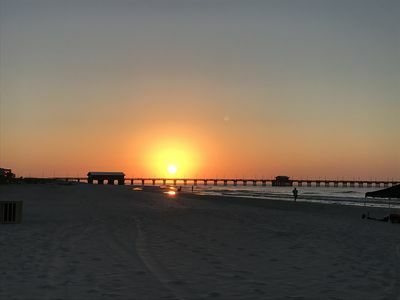 Fort Morgan is on the edges of Gulf Shores, but offers privacy and a slower pace that you cannot find in Gulf Shores proper. Here you will not find rows of chairs 6 people deep on the beach or have long waits at restaurants. Your beach and golf paradise awaits. 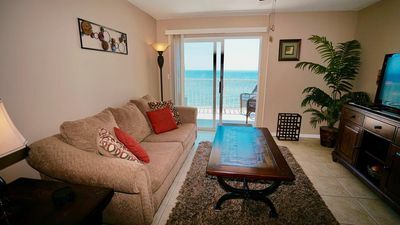 Beautiful Gulf Front 4th floor condo 2BD/2BA w/Bunk Room/Amazing Views!!! Family friendly fun in the sun! 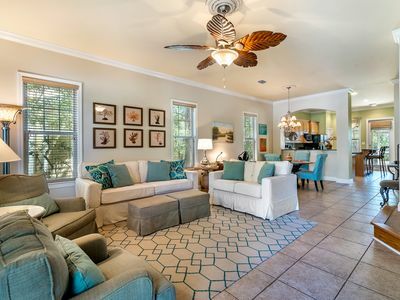 Gulf front community!! Golf cart, indoor & outdoor pools! Pet friendly! 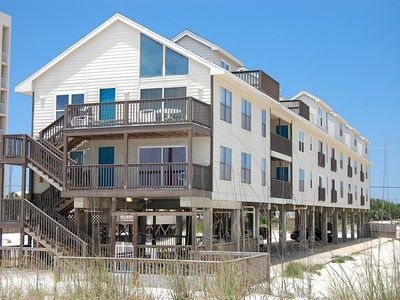 Steps away from White Sand Beach, Dunes and Water! Uncrowded, Natural Beauty!